Iris has several types. These are some settings which many people use and I selected for you to understand how Iris works more quickly. Basically, these are some different preset values that I made. 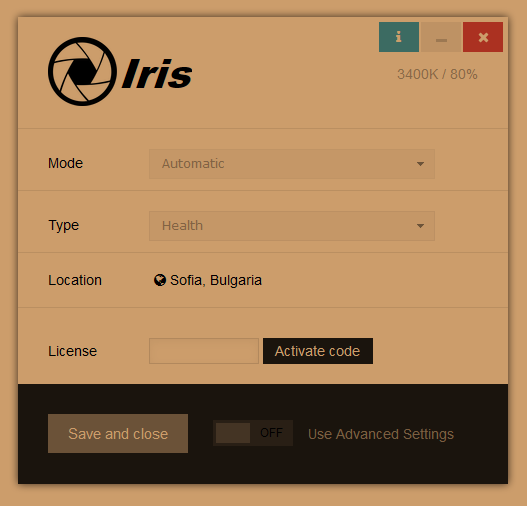 The presets are a little different in different models of Iris. 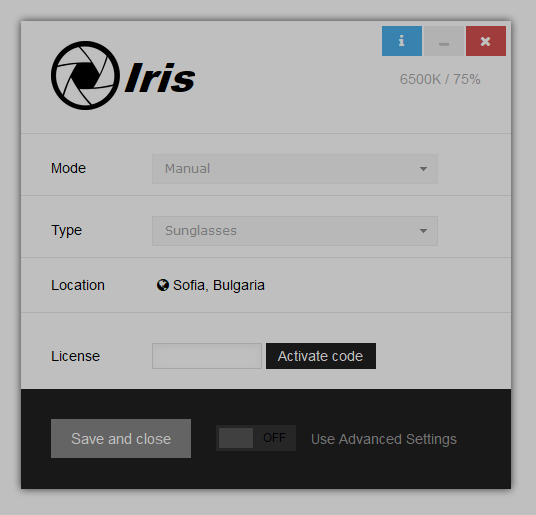 In Iris Pro all reduction is stronger and closer to the best possible eye protection. 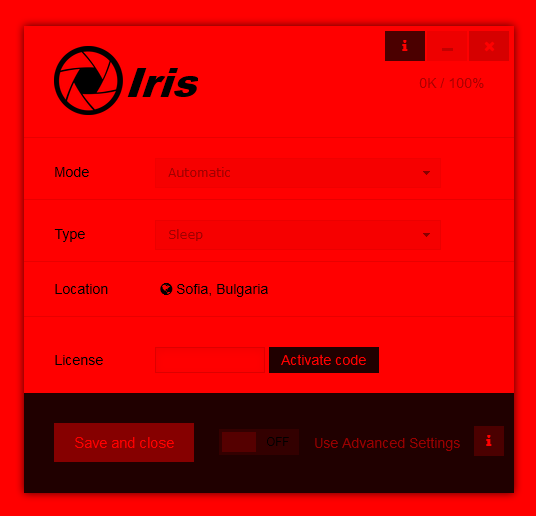 Bellow, you can find the values of Color Temperature and Brightness for both Iris and Iris Pro during all transition periods. You see how in Iris Pro you have better values for Blue light and Brightness – 6000K vs 5000K, 4400K vs 3400K, 3700K vs 2700K, 85% vs 80%, 75% vs 70%, etc. Now, I will try to explain what every type does and when to use it. Health mode is the preset which I and almost all users use. It’s made for slight blue light and brightness reduction. It feels really good on the eyes and doesn’t change the colors much. Sleep mode is for the best sleep. It will remove all the blue light from your screen and set the Color temperature to 0K. During the day the Brightness will be 100% and during the night it will gradually change to 80%. Use sleep mode when you want to get to sleep in the fastest amount of time after using your PC. Reading mode will make all your colors black and white like E-ink device. 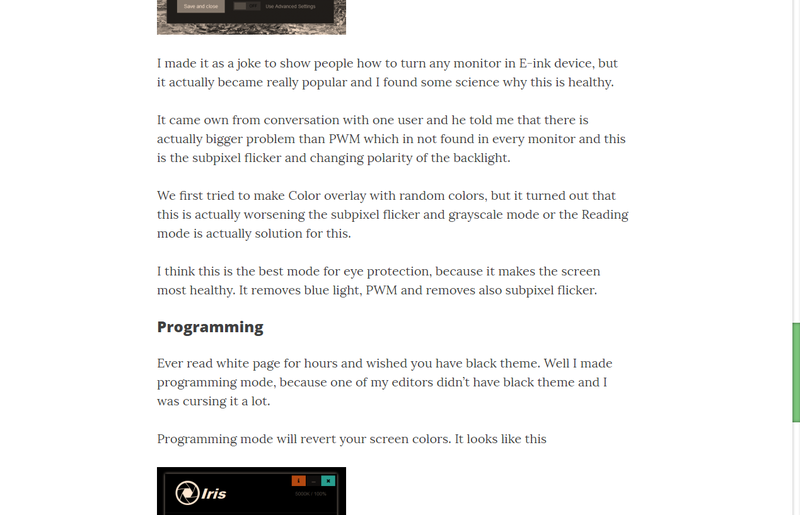 I made it as a joke to show people how to turn any monitor into E-ink device, but it actually became really popular and I found some science why this is healthy. It came out from conversation with one user and he told me that there is actually a bigger problem than PWM and this is the subpixel flicker and changing polarity of the backlight. We first tried to make Color overlay with random colors, but it turned out that this is worsened the subpixel flicker. Grayscale mode or the Reading mode was actually the solution for this. I think this is the best mode for eye protection, because it makes the screen most healthy. It removes blue light, PWM and subpixel flicker. Important! On Windows 7 you need to enable Aero to get Reading mode to work. Ever read white pages for hours and wished you had a black theme. 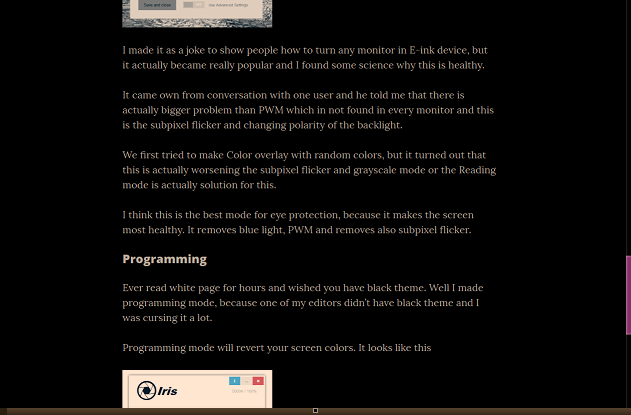 Well I made programming mode, because one of my editors didn’t have a black theme and I was cursing it a lot. I personally use this mode when I write something in editor with White theme and I am sure you will find your way. The bad thing is that pictures will be inverted also, but you will probably not look at pictures when you use Programming mode. Biohacker is the combination of inverted colors and no blue light. You can say that it’s the combination between Sleep and Programming mode. Use it if you want to hack your sleep somehow. Pause and activate it and measure your melatonin levels. This is not made for everybody, but use Biohacker mode if you like it. Sunglasses mode will only decrease the brightness during the night and not touch the blue light. The reason for this is because some people use blue blocking glasses to block the blue light instead of Iris and they prefer their screen colors to be more real. Blue-blocking glasses are really hot today, but they actually do the same work like regular sunglasses which also block blue and UV light. 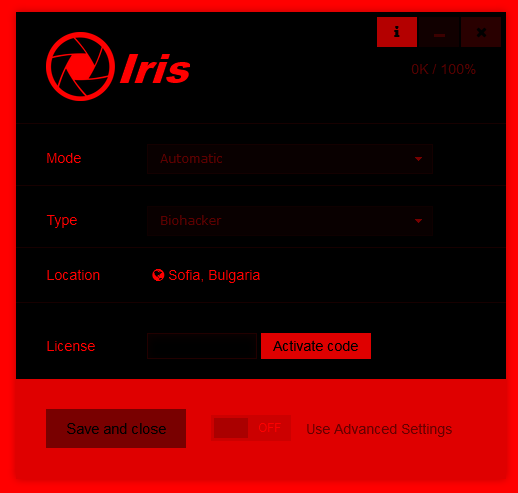 Use it if you wear blue blocking glasses or sunglasses in front of the screen and don’t want Iris to touch the blue light emitted from your screen. 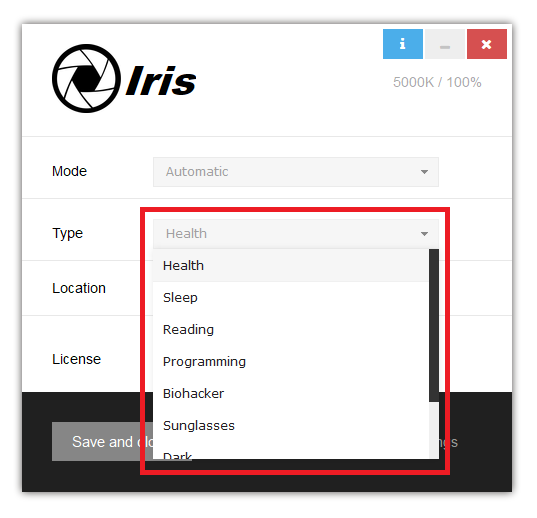 Iris will only reduce the brightness without PWM during the night for less eye strain. Dark mode will make the corners of the screen more dark and will reduce the light emitted from the screen. This is usefull if you want full brightness, but still want less light. It will also use the Health preset as values for blue light and brightness. Use it when you want less light emitted from the screen, but still want your brightness to be high value. So I was watching one scary movie and all the scenes were dark. I put my monitor at maximum brightness, but still it was too dark to see anything. I then closed Iris, but it was again too dark and my eyes got strained. Then an idea came into my mind. What if I can increase the brightness over the maximum? The next day I tried to accomplish this and I did it. You may think why do you need this, but there are several cases when this mode is useful. Use overlay mode if you want all your colors to be as close to normal as possible, but still want to protect your eyes and have good night sleep. Use overlay mode if you have multiple monitors connected with USB or with some docking station. 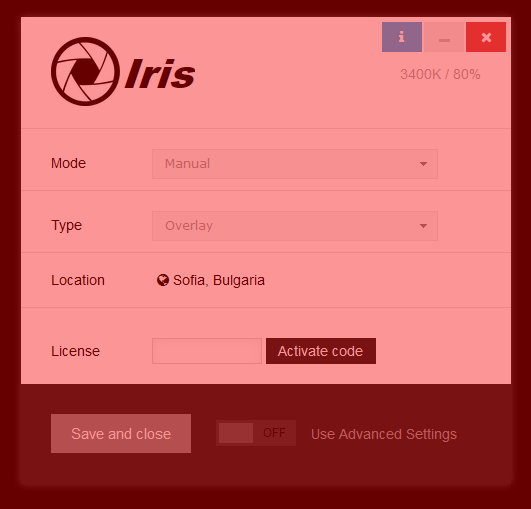 On strange configurations like this, Overlay mode and High-level Color API are the only ways to get Iris running on all monitors. The chart above lists “sunglasses” as the mode that reduces flicker. Don’t all the modes reduce flicker? If I need flicker reduction and blue light removed, is “Reading” mode the only mode available that does both? You say “Reading” mode is the healthiest but the brightness of this mode seems to stimulate at night where as “sleep” mode is more sedating. I prefer the red light of “Sleep” mode but also want flicker reduction. Which mode is best? 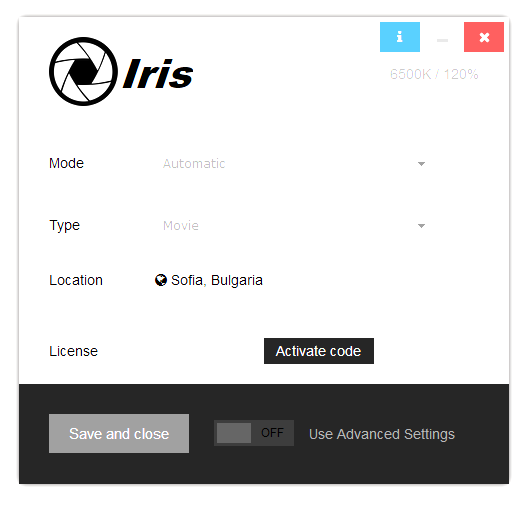 I bought IRIS PRO a few days ago. My card was charged. However, the activation code you sent me was not recognized by your software. I tried to reach you via your online form but no one has responded to me. The $49 charge is pending on my card. If I don’t hear from you by Wednesday, I will contact my VISA to dispute the paypal charge. Thank you for this prompt reply Daniel. I have a Macbook Air LED-backlit glossy display, pretty sure this classifies as a “LCD” screen and therefore in need of the additional subpixel flicker reduction. Is “Reading” type the only setting that reduces subpixel flicker? Is there a way to combine the benefits of Reading type AND the red Sleep light? Is there a way to adjust flicker using the Advanced Settings (Besides having the native monitor brightness maximized)? Or is Reading type the only way to control it more? Blue light and flicker will not kill anyone but they may cause delayed sleep, eye strain, and headaches. 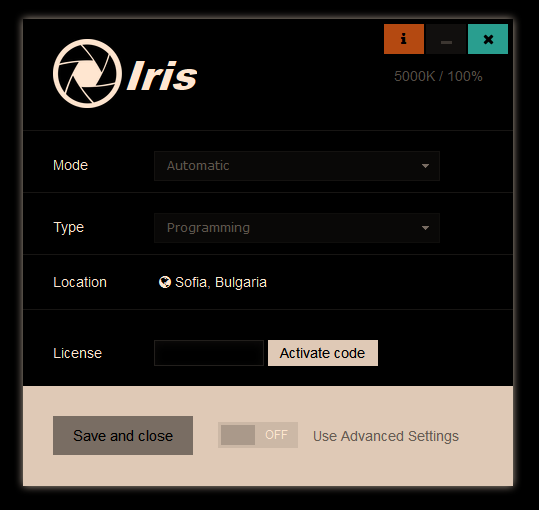 It’s good to reduce the blue light because it causes some health issues like macular degeneration in the long run but for flicker, if you set your hardware brightness from the monitor buttons to 100% and let Iris control the brightness automatically you should be completely safe from flicker. Also if I want to process any photos how do I get natural colours with Iris? What do you mean by monitor locked? Is it some limitation on your monitor’s brightness? 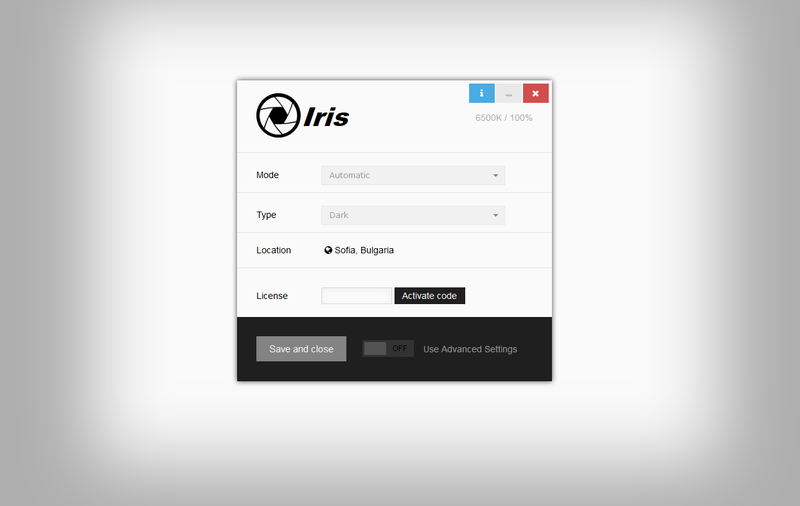 I wish to try Iris. How can I log in ?